It’s that time of year when many hunters start blowing up social media with pictures of their “target” bucks. Even I have to admit that some of the trail cam pictures make me look twice. I often think I’d do the same thing if I lived somewhere in the Midwest or even somewhere that I wasn’t surrounded by big mountains and a limited number of deer, deer that don’t move too terribly much throughout the summer months. The woods are extremely thick in many of the places I hunt, and the places resemble the jungles of South America. As more and more photos pop up, I see people, even young men and kids, who think they are only successful if they kill big bucks. They have to kill one of these “target” bucks. They begin talking about other deer and call them dinks, scrubs and management animals. I’m not sure why, but this type of behavior rubs me the wrong way. I’d say it’s because I was brought up in another era, an era when the hunt wasn’t all about plastering your success all over the internet. Instead, the hunt was considered a success if you had a good time afield and were lucky enough to shoot a buck of any kind. Every now and then someone might anchor a big buck to the ground, and that hunter would be considered the king for a week or two but no longer than that. After the kingship ended, he would fall back into the ranks of guys who loved being in the woods. I began hunting when I was a kid. I was instantly taught how to respect the woods and learn how animals navigated from place to place. I became educated with the lifestyles of many animals, not just deer. As I wandered over hills and valleys and poked my way through swamps, I learned how to get around in the woods. Eventually, I was comfortable enough to go into different pieces of woods where I had never been, find a place on a map and meet my dad there for lunch. I spent hours upon hours scouring through the woods in my teen years. Any time I had a chance to be in the woods, that’s where I went. I wanted to learn the ins and outs of terrain. I studied the landscapes and tried to figure out why I found deer sign in certain places. I became accustomed to why deer avoid some great looking places and go into the heart of places you would never expect them to be. I continued my education of deer by being in the woods throughout the year, even if I only had a few hours here or there to tramp around the corner of a hill next to the road. I learned how to use my compass to get to places on topographical maps, and I learned what to do if I got into trouble while I was hunting a mile or more from the road. I learned how to take notice of the telephone poles numbers where I went into the woods so I would know which way to walk to get back to the truck when I came out at a pole that was a mile from where I parked. As the years rolled past, I realized that all of the woodsman skills I had gained were the true reason behind my success. I became accustomed to the forest, which allowed me to become familiar with the personalities of the animals that lived amongst the trees. I found those tricky spots that every deer in the woods would head to at least once during the course of the fall months. 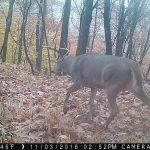 I also learned how drastically the patterns of deer change from week to week and month to month, sometimes changing as quickly as the flick of a switch. I saw how deer congregated in certain areas, but when the first snow stuck to the ground, those same deer disappeared and never came back until the following year. You can begin gaining knowledge the instant you open an encyclopedia, just like you can increase your odds of getting nice deer if you make it a goal to learn more about the places they live. You’ll never get a big buck if you’re not hunting where one lives. Maybe this year you should re-evaulate your goals. Instead of chasing deer all over the countryside, maybe you should just focus on learning more about the woods where you are hunting. It’s an education that will never leave you. Use this knowledge to become one of the animals in the forest. If you live in their world, you will find it easier to understand what they do and why they do it. I’m going to try to do a few of these short essays before hunting season, although I will be gone to Colorado for a few weeks in September. If you are interested in me doing a Facebook live type of thing to talk about it, please sound off and let me know what you think. ————————————–> Good Luck this season. Shoot straight. This entry was posted on Friday, August 17th, 2018 at 2:49 pm and is filed under Uncategorized. You can follow any responses to this entry through the RSS 2.0 feed. You can leave a response, or trackback from your own site. An awesome read! I could relate to every sentence. Spending my early years with my dad, getting to know the woods, and identifying almost every hard and softwood here in Vermont, gathering wild Ginseng, Squirrel hunting, trout fishing, etc. Finally harvesting my first white-tailed deer at the age of 14, I was instantly hooked with a passion for the wilderness unmatched by anything else I do. Ironic that I see this post, shared by a friend. I’m 55 now and tonight we just had a venison dinner from a deer I got last bow season. Thanks for a great read! Raymond, I’m glad the entry hit a spot for you. When I write stuff like this, I hope that it has the intended reach, and by reading your comment, I definitely know it made its way to the right people. Thanks for reading and commenting.